There are still three names on ‘The Bride’s’ revenge hit list, as well as the task of finding her daughter, who she thought had never been born. 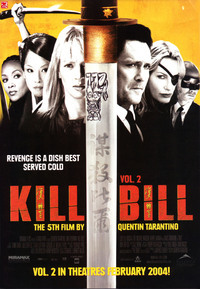 With this thrilling, must-see movie event, writer and director Quentin Tarantino (PULP FICTION) completes the action-packed quest for revenge begun by Uma Thurman in KILL BILL VOL. 1.